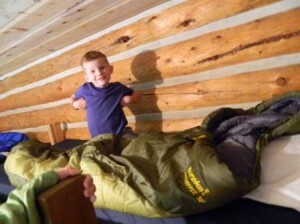 My oldest boy is going to be a camper for the very first time this year. Since two of our most experienced and awesome guy counselors were spending the week Scruffy had the idea of holding a practice camp for our oldest and any of the kiddos who were too young to be campers. 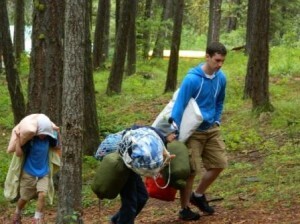 And so my three boys, my nephews and niece, and our cook’s grandson got the chance to be campers for a day. 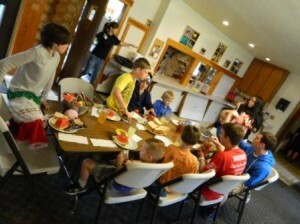 They went on a hike to the pond and ate lunch without their parents at a camp table all together. They did archery and built sand castles, sped down the slip-n-slide and played board games. They had a little campfire and read stories with Shinobi and Maximus. Then my 3 little guys hiked all the way up to the Mountain Panther cabin and slept away from home for the very first time. Thank you Shinobi, Maximus, Hatu, and everyone else who helped to make a marvelous day of memories for our little ones.